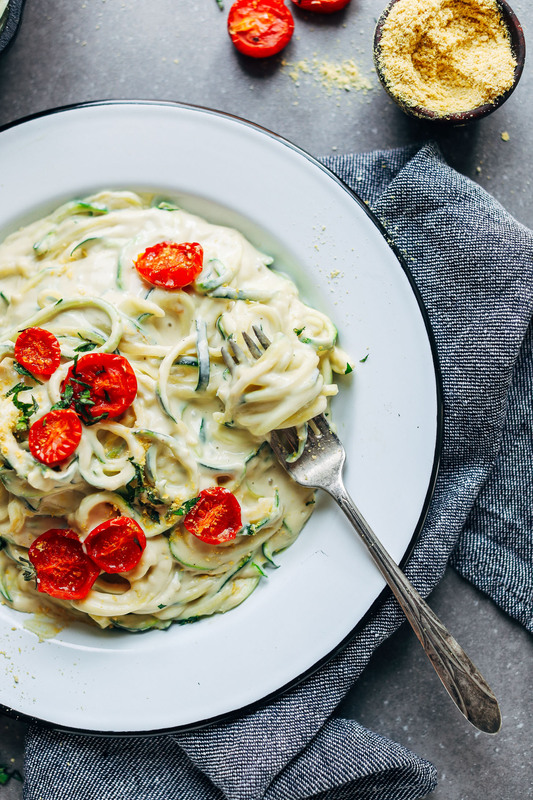 Consider this the only vegan alfredo sauce you need. It’s the perfect dairy-free alternative to classic alfredo sauce! Plus, just 7 ingredients and 30 minutes required. Let’s do this! The base of this alfredo is quick-soaked cashews in very hot water so they soften quickly. Then it’s a matter of flavor: nutritional yeast for cheesiness, garlic for kick and depth of flavor, salt for saltiness, and a bit of almond milk for texture. Arrowroot powder adds thickness and helps the sauce get a bit “stringy” like real cheese! This would make the perfect sauce for zucchini noodle pasta or your favorite pasta (I prefer gluten-free fusilli!). Top with Slow Roasted Tomatoes for even more flavor! This sauce could also pair well with baked lasagnas, served with my Eggplant Parmesan, or even used as a white sauce on pizzas. For more Italian-inspired dishes, check out our Simple Chickpea Bolognese, Eggplant Lasagna Roll-Ups, Easy Vegan Pizza, Spicy Red Lentil Pasta, and Vegan Pesto Parmesan Breadsticks! If you try this recipe, let us know by leaving a comment and/or rating, and don’t forget to tag a photo #minimalistbaker on Instagram. Cheers, friends! Recipe updated 10/18/17 to include more almond milk for thinner texture, and noting arrowroot as optional. Creamy, saucy cashew alfredo in 30 minutes! The perfect plant-based sauce for all your pasta night needs. To blender, also add arrowroot starch (for thickening), nutritional yeast, garlic, sea salt, vegan parmesan cheese, and lesser amount of unsweetened dairy-free milk (1 cup (240 ml) as original recipe is written). Blend on high until creamy and smooth, scraping down sides as needed. Taste and adjust flavor as needed, adding more garlic for kick/zing, nutritional yeast or vegan parmesan cheese for cheesy flavor, salt for saltiness, or dairy-free milk if too thick. Transfer to a rimmed skillet and cook over medium-low to medium heat for 5 minutes, whisking frequently. The sauce should thicken and bubble. Add more dairy-free milk as needed to thin (I typically add up to 1/2 - 1 cup (120-240ml) more // amount as original recipe is written // adjust if altering batch size). Then it's ready to serve! Enjoy with zucchini noodles or your favorite pasta. It could even be enjoyed layered in lasagna! Top with additional Vegan Parmesan Cheese and Roasted Tomatoes for more flavor. *2-3 cloves garlic yield ~1 1/2 Tbsp crushed garlic. *Nutrition information is a rough estimate calculated without additional toppings / garnishes or pasta. I have made this in the past, and it was amazing. Planning on making it again for Easter brunch, but I was wondering if I can make the sauce the night before. What do you think? That should work! It may thicken as you reheat it on the stovetop, so just thin with more almond milk or water. Hope that helps! I love this recipe! I made it to substitute a cream sauce in my Creamy Lentils with Mushroom and Kale dish that I made by Sexie Veggie. It turned out really flavorful and paired well with my dish. I did use some organic parmesan cheese that I had but not a lot and I substituted broth for the non dairy milk product. Yummy! Who needs dairy anyway? There doesn’t have to be any sacrifice in eating plant-based. 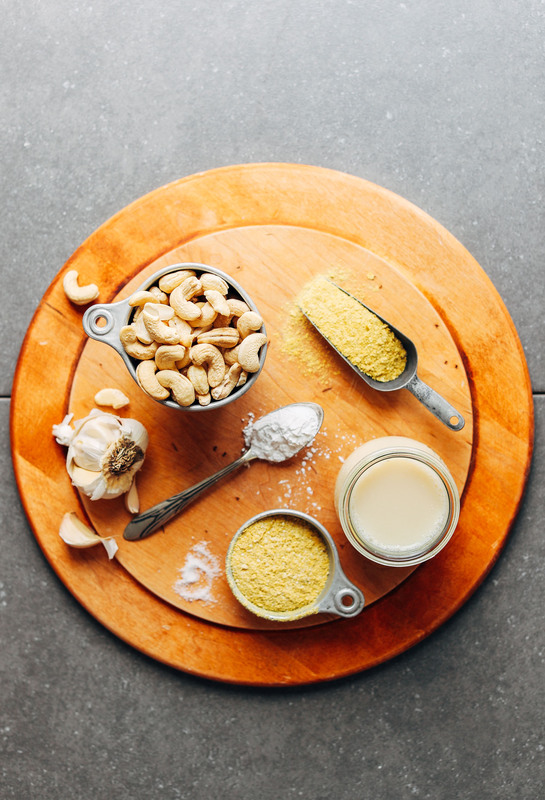 Cashews are one of the “secrets” to great vegan cooking. Thanks for sharing this delicious recipe! Three words: A-ma-zing! Quick and simple, creamy, totally hit the spot on a night when we were willing to spend a few extra calories on an indulgent meal. I’m throwing out all our other vegan Alfredo recipes. This was so easy and delicious! I added about a 1/4 cup of fresh basil leaves to the blender which gave the sauce a lovely mild pesto flavour and then I simmered a splash of white wine in the pan before adding the sauce. I used fusilli which I thought ‘gripped’ the sauce really well. Lastly, I stirred in some cooked spinach and mushrooms at the end. This was a keeper! 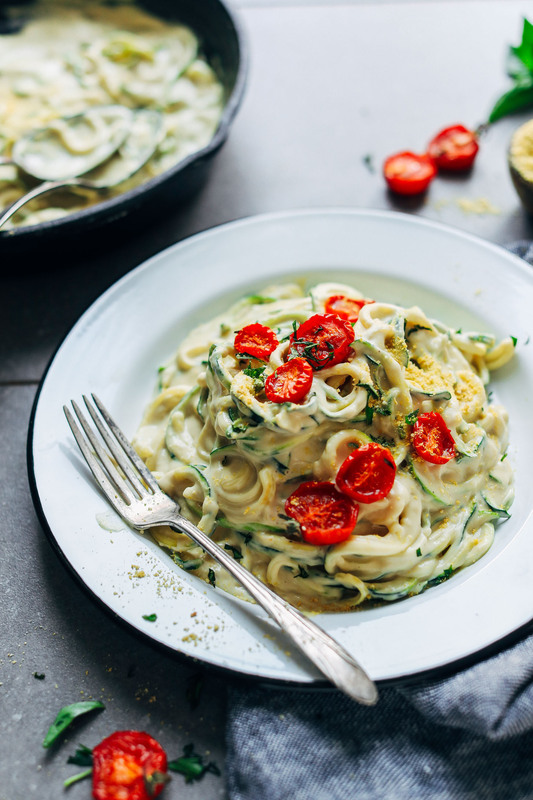 My favourite vegan alfredo recipe! Absolutely delicious!! You never disappoint me though! Everything I’ve tried by you is delicious!! Anyone try this with oat milk yet? Made this tonight for dinner and it turned out better than I could have expected! My husband loved it too. Will definitely make this again! Thanks for the recipe! This recipe looks delicious! What if I where to use cornstarch instead of arrow root would it still come out the same? Hi.. for the 1 1/4 cups raw cashews (soaked), do you mean One AND 1/4 or ONLY 1/4 cup? Hi – I made this recipe this evening, but since it’s November I made a few adjustments to turn it into a fall dish. First, I used spiralized butternut squash that I found at Whole Foods and a half cup of peas. Second, I added a 1/2 tsp of Trader Joe’s pumpkin pie spice to the cream mixture in the blender. Finally, I sprinkled roasted and unsalted shelled pumpkin seeds on top prior to serving. It was so delicious I’m already thinking about my leftovers. This was delicious and super simple, as are ALL of Minimalist Baker recipes! I did end up using a little more salt and nutritional yeast, and also added peas. Thanks so much for this – it was my first attempt at alfredo since going vegan 2 years ago and I LOVED IT! Just made this tonight and I loved it! Not sure that I would have needed to heat it in the sautee pan as that really thickened it more than I needed and it can be warmed a little in the vitamix. I used it to top a red lentil pasta and added Trader Joe’s roasted tomatoes. AWESOME. Will definitely make again! Delicious – I made it without arrowroot and worked great. I added some chopped up sundried tomatoes I had in my fridge for a little extra something. I spiralized 4 zucchinis and a box of Jovial pasta and had a good amount of sauce covering them. I could’ve probably done five zucchinis but I like my pasta sauce-y! I love this recipe! I have made it a handful of times and it never disappoints! However, most recently I mixed in 2 cups of my marinara sauce to make a creamy marinara. It was AWESOME! Thank you for sharing such amazing recipes! I made this to go with chickpea shell pasta (the banza brand) and it came out great! I didn’t really measure out the almond milk, just went by eye as I cooked and it was the perfect consistentency! I subbed cornstarch because I had it on hand and also used roasted cashews because raw were too expensive. I rinsed all the salt off and then soaked them for most of the day until I was ready to make the sauce and the flavor remained neutral with a touch of toastiness. The only change I would make next time is less garlic, i went with 3 cloves and it was a bit intense. Would it be possible to make this with purchased, pre-made cashew milk, instead of the almond milk + cashews? I do not have a blender that would process it but a milk-allergic child who so misses pasta and alfredo especially. Thank you! Hi Jen! 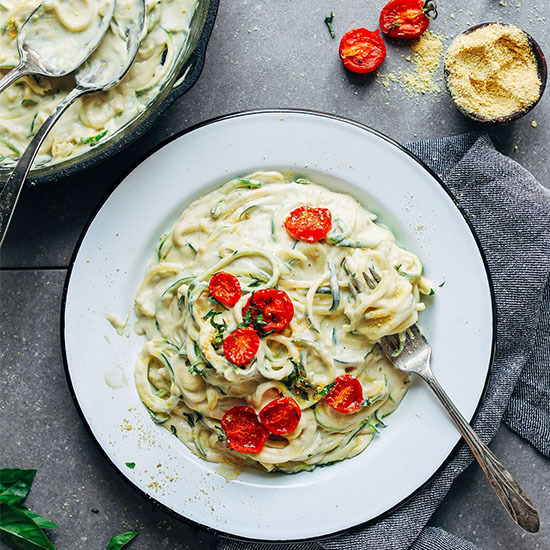 That unfortunately will not work the same, as the whole cashews create the thick and creamy texture in this Alfredo that you wouldn’t get from store-bought cashew milk. Could I use brown rice flour instead of arrowroot? Also, I don’t have access to a vegan Parmesan, what do I use instead?? Just more nutritional yeast? More nutritional yeast will do, yes! We haven’t tried using brown rice flour in place of arrowroot, but if you experiment with it, report back! I just made this sauce tonight. I followed the recipe to the T. This sauce is great as a base for any pasta or vegetable dish. The possibilities are endless. Thank you so much for sharing this recipe. I am going to freeze some of it and will let you know how it turns out. I make this regularly and love it. I typically quick soak my cashews (hot water for 20-60 mins) and sub tapioca starch for arrowroot because it’s what I have on hand. Best results are with cartoned coconut milk (Trader Joe’s coconut beverage, no sugar added), worst results with unsweetened vanilla almond milk (the vanilla gives it a very odd, unpleasant flavor). I mix this zoodles or Trader Joe’s lentil pasta, or pour on top of sweet potatoes, basically anything that would taste great with creamy cheeziness. This is easy and so satisfying. We served with zoodles a little lightly steamed broccoli and roasted tomatoes. Thanks for sharing this recipe. Hi, I found your site through Samantha Ravandahl on YouTube, I’ve been wanting to make this for so long but I have a question, could you use carton of cashew milk / cream ? If so would I need to change the recipe in any way? Thank you. Hi! Are you thinking in place of the almond milk? I just made this and threw a few handfuls of basil from my garden into the blender along with the rest of the ingredients. It’s a pretty shade of green and tastes so good! Hello! I made it with unsweetened almond milk but the sauce turned out too sweet for my liking :( Added some apple cider vinegar to balance the sweetness but that drowned the cheesy taste from the nutritional yeast. Any idea how I can reduce the sweetness of the recipe? I checked no other ingredients I used have added sugar. Hmm we are not sure what would be causing it to be sweet, Sylvia! I’d recommend lemon juice or a small amount of vinegar perhaps? Hi! I am a gastric bypass patient but I’m also in household of 11 and our food budget can be tricky. Can I use a dairy milk, skim specifically? And garlic salt instead of cloves? I have these on hand. AMAZING!! My daughter has fairly recently diagnosed food allergies, and this was a lifesaver. Back when she could have dairy and gluten, fettuccine alfredo was her favorite dish. She had to ask me several times during dinner if this was actually dairy free!! :) I skipped the arrowroot, added some black pepper, and used your recipe for vegan parmesan cheese, and served topped with fresh basil with GF Barilla spaghetti for her, and zucchini/squash spiralized pasta for me, it was delicious both ways, but especially luscious with the veggies!! This is just perfect for a simple, quick and easy alfredo sauce! I made some tonight and my residents (I’m an RA) loved it- even the non vegan ones ;) I don’t have a high speed blender, just a regular one, so I was worried about the cashews not blending up enough. BUT I softened them in my pressure cooker with some water for a couple minutes instead of the standard soaking method, and it worked like a charm! They got very soft and blended up nice and smooth, and it took much less time, too. I have recently learned of a dairy allergy, and in the attempt to make one of my favorites, I tried this one. Absolutely delicious! I did not use the cornstarch or any thickener and it came out creamy and perfectly coated my linguini. Thanks so much! With my work schedule and a 3 yr old I never really had time to make anything for dinner. I have tried 5 different recipes from your site, and I must say they are incredible! Not only are they easy, but they are delicious! Tonight I made the Cashew Alfredo, and I couldn’t believe how amazing it turned out! I did substitute corn starch for the arrowroot starch, and it was perfect. THANK YOU for posting these recipes that are actually EASY to make! I would love any suggestions on what to make for my super picky/fussy 3 year old!!! Absolutely delicious! I’ve wanted to attempt this kind of dish but was afraid to do so. We loved it. Your recipes are always fabulous. Thank you so much! Could it be frozen? What’s the best way to reheat it if frozen? Hi! Would a food processor work if I don’t have a high speed blender? Oh but I have a nutribullet! Which one would work best? Hmm I think you may have success with the nutribullet if you don’t have a highspeed blender! Just made this and will probably put in compost. No one is willing to eat it. very good! even my non vegan friends loved it ! Loooved this!! I was very hesitant to try recipes that used ingredients like this, because it just seemed like such a process…. and like it would take foooorever. That was until I HAD to go dairy free. Then of course you want what you can’t have and I craved pasta Alfredo. So I had tried the Mac and cheese recipe which was delish! I made this tonight and it was soooo quick and easy! It can seem intimidating if these aren’t regular ingredients in the pantry but they are now in this house!! I had made zoodles to start and I don’t think I’ve mastered cooking them. They just didn’t keep the flavor of the sauce well and the zoodles watered it down even after I drained water out of the pan, so I made some gf pasta and mixed the rest of the zoodles in with it and that was ?? Yum! I didn’t have nutritional yeast and arrowroot starch so I used Vegemite (concentrated yeast extract) and tapioca starch instead and it turned out delicious still! The sauce was sooo creamy. I topped mine with slices of pan-roasted mushrooms. Will definitely make this again!! What type of nutritional yeast do you prefer or does it matter? Is there an alternative that can be used for nutritional yeast? I am allergic to both brewer’s yeast and bakers. Made mine with the carrot spirals from Trader Joe’s instead of actual pasta! Soooo good! Very tasty. 2nd time making this with my girlfriend. Much appreciated!! Do I really need nutritional yeast? Is there something else? It is hard to find here. If you can’t find it, you can leave it out! Oh Dana, This look so creamy and delicious!!! I am going back on an oil free, plant based diet due to inspiration from Dr. Michel Gregor and the recent I Thrive series. Thank you so much for your beautiful, wonderful, delicious recipes!!! This was amazing! I added pepper for spice and it was delicious! I love all that you put out here, thank you! My friend and I tried to make this recipe last night, and we woefully underestimated the power and necessity of a high-speed blender (the sauce tasted great, but the texture was AWFUL). Is the Blendtec in your link the blender that you use? Yes – a high-speed blender is a must! We use this one. It was excellent and very filling :-) i have also roasted the garlic and three shallots before adding them to the blender and it was delicious.. together with bean noodles the sauce makes a perfect combo, love this. Many Thanks Dana, you’re my Nr 1 Vegan inspiration ? This was fantastic! I omitted the Vegan parm and used 1tbsp of tapioca starch and just 1 cup of almond milk. I mixed it with a jar of store bought arribiatta sauce after thickening the mixture on the stove top. This mix made the perfect thick rosé sauce. Thank you for sharing. OMG this recipe is so delicious! I’m not vegan, but I even think it tastes better than original sauce! Plus this recipe is healthier too! THANKS SO MUCH!! I am wondering about nutrational yeast which you make use of in a few recipes (like this one). I’m struggling to find it in a store near me. What is the purpose of nutritional yeast in your recipes and can I use a substitute? I look forward to your reply? Hi Bri! Nutritional yeast has a great savory, cheesy taste used as a substitute for cheese in many recipes! You can try Marmite or Vegemite, but many people do not love it as much as Nutritional Yeast, but it’s worth a try! Made this for dinner tonight. I skipped the arrowroot powder (the cashew sauce thickened up as I heated it with the pasta, so I didn’t bother with it) and vegan parm (couldn’t find any at the store). I added lemon juice to the sauce. I used Tagliatelle pasta and fried up some mushrooms, peppers and onion and mixed it all together. I found this recipe makes A LOT of sauce, so next time I will prop cut it in half, or save the other half for another dinner later in the week. 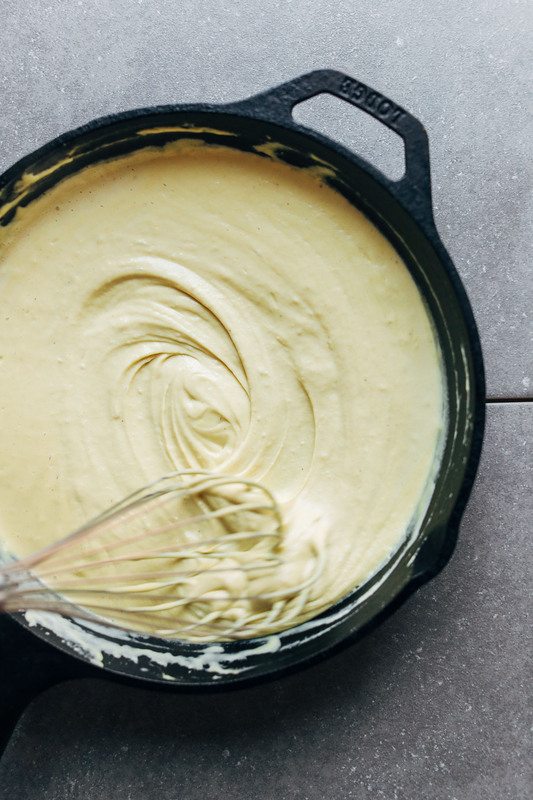 Nothing too mind blowing about this recipe, but the one thing to take away from it — if you haven’t made a cashew sauce before — is that boiling the cashews before blending really helps make a creamier sauce, especially if you just have a basic blender. This recipe is a GAME CHANGER. I used corn starch, but not sure it was needed. I used a vegetable stock and almond milk combo (though I added more almond milk to thin.) The veg stock takes away from the creamy white color a bit, but provides a little extra flavor. I’m going to use the leftovers to make a bechamel butternut squash lasagna and if I have any additional left, thin it a bit more and add pumpkin puree and serve over pasta, garnished with sage. 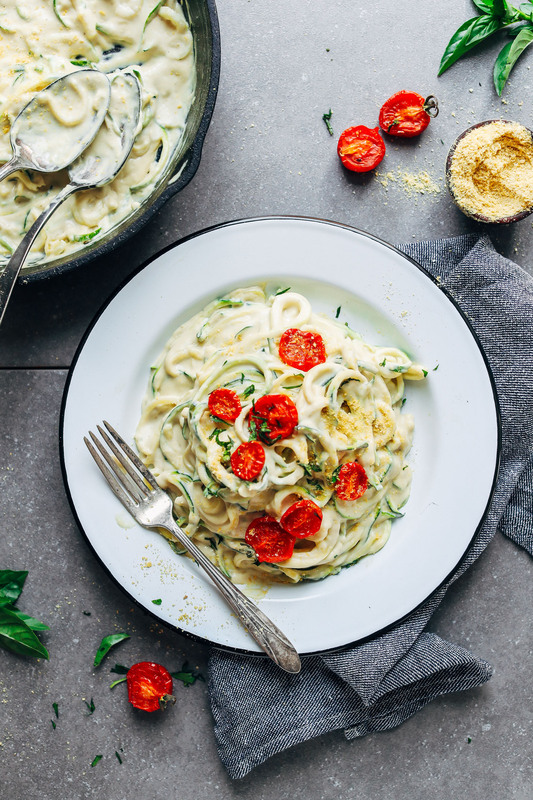 This recipe looks very good, I’ve been looking for a vegan alfredo sauce recipe and can’t wait to try this one! I made this and and drizzled it on the yam ravioli from the cookbook.. It was literally heaven!!! I highly recommend making a batch a ravioli and keeping them on hand in the freezer with a quick alfredo sauce to really make the dish sing! I love this recipe. It was a little thick so I added more almond milk. Also, I sauted onions, mushrooms and diced zucchini in avacado oil. I added the cashew mixture to that and cooked it for several minutes then added the pasta. This recipe is definately a keeper. This looks dreamy! Do you think if I put real parmesan in it it would still turn out okay? I am not vegan, but I love the nutty-ness of cashew sauces! Do you have Celiac disease? Why do you eat GF so often? I do not have celiac, I just try and avoid gluten for health / gut purposes. Plus, plenty of our friends eat GF and cooking for them often requires GF recipes. How are you supposed to prepare zucchini noodles? Do they stay raw, or are you supposed to cook them prior to adding the sauce? If you do cook them, how???? Hi Gabrielle! 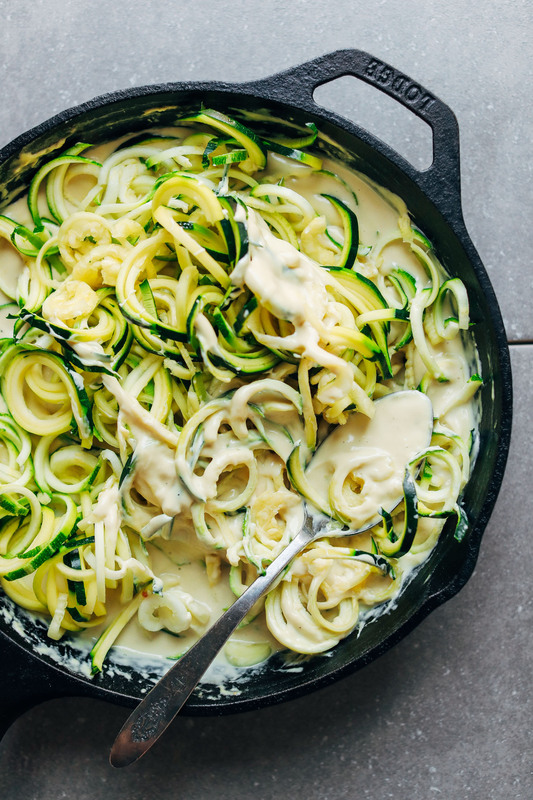 Follow this recipe on how to make zucchini noodles! This looks amazing! Any thoughts on if I could sub hemp seeds for the cashews? Thanks as always for beautiful food! Hi Eliana! That should work! OMG yum! This sounds super delicious despite of its simple structure and minimal cooking time. It is definitely too long since I have used cashews, I totally forgot how much I love them. Soooooo I would proooooobably eat the whole recipe. I wouldn’t regret a thing. ;) Alfredo used to be one of my favorite pasta dishes! This looks like such a gem! Easy to prepare and tastes good. I’ll use a more thickened version as a dip. I’ve had success with all of your recipes with the exception of the coconut yoghurt. I persist with different brands but so far have ongoing fails. Maybe it’s just what’s available or not in Australia. Thanks for another great recipe. Lovely – thanks! So sorry about the coconut yogurt. It does seem the right brand of coconut milk is essential. However, you could also try blending fresh coconut meat, adding probiotics, and doing the same process! Hope that helps. I made this tonight and it was fantastic! I didn’t have arrowroot powder, so I used corn starch. Worked great, but I would like to try it with the arrowroot powder. My husband loved this recipe too, and he is a meat and cheese lover. Thanks so much for the recipe! I loved this and my non-vegan friends enjoyed it as well. I ended up adding a drizzle of olive oil at the end because I felt like I overcooked it a little right at the end. It added a nice touch. Thank you so much for this recipe, I did use the suggested toppings of vegan parm and roasted cherry tomatoes. SO good. Great addition! Thanks for sharing! This looks delish!! I cannot wait to try! Very new to plant based eating, which can be overwhelming!! Made this for dinner and it was a huge hit!!! So much to learn but super grateful for sites like yours that are full of great recipes that have been delicious and taken away some of the fear of embarking on this new food journey!!! So lovely! Thanks for sharing, Cheryl. Tasty sauce, I doubled and only added 2 cloves garlic, next time I’ll use just one as it hid the cheese taste. Also mine was grainy so you need to pulse thoroughly. Very easy to make and a satisfying sauce. Lovely! Thanks for sharing. Yes, a high speed blender is essential for a creamy texture. I made this for dinner tonight, it’s delicious! I substituted cornstarch for arrowroot. I added a lot more non dairy milk (maybe double or triple the amount) and it still was very thick. Did I misread the instructions, it’s only 1/2 cup milk? At any rate, it was delicious and will make again! Hi Anne! It is 1/2 cup, but I’ve added a note in the instructions that I add more as needed to blend / thicken. That’s just a good starting point. I get so excited when I see you do a comfort food makeover to make it as healthy as possible. This looks delicious! Would this be okay without the vegan parm? I can’t find that in any stores near me! Hi Bethany! You could make our vegan parmesan recipe! I had a similar question. The vegan parmesan recipe is pretty much all the same ingredients, could I just add some more nooch and garlic instead of adding this whole other step? Hi Shay! We haven’t tried it, but it should work! Would tapioca starch in place of arrowroot mess it up? I have not been able to find arrowroot, but have tapioca readily available. I would say leave it out or sub cornstarch! could you sub white beans for cashews? I am wondering, just in an effort to cut the fat content. I don’t think that would work, personally. But if you give it a try let me know! i made this today and it turned out very gluey – even with adding more almond milk…. I don’t think you need to add arrowroot starch to the mix. I must have added an additional 1.5 cups to keep it smooth and creamy – which it never turned out to be. I did add roasted tomatoes to the mix which added a nice touch. I will make it again but will leave out the arrowroot starch. Thanks for sharing! You could even scale back the amount of arrowroot to 1 tsp or so. I just find it gives that gooey texture cheese does. But you’re right! It’s plenty thick without it. Thanks for sharing! I made this tonight and it also came out gluely.I also added about 1 cup additional almond milk and the sauce still turned out super thick. Both my husband and I, we’re not happy with the sauce. I hate to say it but we dumped it. shoot! I’d say next time plan to add more almond milk to share. And when it comes to the texture, omit the arrowroot starch to ensure it won’t thicken even more. So I’ve learned that if you stop whisking when you put it in the pan, and just let it sit, mine started to get gooey globs in it. Not sure if it’s from the arrow root or the cashews. So I turned the temperature down and added a little almond milk at a time to thin it out a bit. I’m not sure if this is the same issue. Also you could try tapioca or corn starch instead! Sometimes I feel like arrowroot can be a little tricky. Very yummy and quick! Next time I’ll use only 3 T of nutritional yeast instead of 4 T as a little “yeasty” tasting for me. Well liked by non-GF and non-lactose intolerant family members. I did use more almond milk to thin – both in the food processor and on the stove. Will make again! Could you sub soaked almonds for cashews? I haven’t tried it myself, but no, I don’t think so. They don’t get as creamy and smooth for me. This was a sucsess! I did use cornstarch because I was out if arrowroot but it didn’t seem to do any harm. It came out super creamy and thick and was delicious! Thank you for all your recipes ? Yay! Thanks for sharing, Ashley! This is very similar to the It Doesn’t Taste Like Chicken mozzarella sauce recipe, that I’ve adapted for creamy cheesy sauce! I find I don’t need to use as many cashews and add more cashew milk. So delicious! This one is just a little more nutritious in my opinion, as it includes less oil and more protein / healthy fats. Otherwise, it’s really a matter of preference! I was just wondering , i often want to do the baked chickpeas , they get soft and strange often 5 mins after i remove them from the oven . Do you have an idea why? Thank uou so much ! Thanks Lauren! I’d say my top tips for this have been peeling the skins off the chickpeas, roasting on a high temp without parchment paper (directly on the pan), and roasting until very golden brown. Then let cool to the touch. Hope that helps! Is there a sub for nutritional yeast? I found out the hard way that I am allergic to yeast in general but super allergic to nutritional yeast. I’m also allergic to yeast. Is there a sub or can I just omit it? Hi ladies! I don’t know of any nutritional yeast substitute at the moment. Perhaps you could research if there are dairy-free cheese on the market that don’t include this ingredient but still add a “cheesy” flavor. Miso paste adds a nice tangy-ness and it is used in other vegan cheese sauce recipes. This looks great! Does it hold up in the refrigerator/freezer if you make it in advance? I would think so, yes! It may thicken as you reheat it on the stovetop, so just thin with more almond milk or water. Thank you Dana! I mixed it all together in the blender, and stored it in mason jars. Followed instructions here to heat it up and added some extra veggie broth for the desired consistency. It made for a quick and delicious meal last night!! This will be a regular recipe for my weekly meal prep! Did you can the sauce? How long refrigerated would it keep? I made this amount last night and it kept expanding (thickening) and I have more than I can imagine eating in a week. I hope you know I’m making your website famous cause I can’t get enough of your wisdom. I belong to Vegan beginners 101 and everyday I share your web. Thanks for sharing our recipes, Marylynn! Could I use cornstarch instead of arrowroot powder? I’d guess that cornstarch will help with thickening, but not really with the stringy texture of the cheese. Better than cornstarch is tapioca starch if you want that stringy-cheesy feel.